The Carnival's Edge is a wonderful place to wander around: there's fairy floss, a delicate carousel, spectacular tents and marquees. One of these is the Marquee de Sideshow, home to "roustabout and snake-oil seller" Paul Zenon - and to the funniest 15-minute show you'll see at the Brisbane Festival. The English Zenon has a rascally charm about him; he is the kind of man you could see swindling greedy pub patrons with a twinkle in his eye and their watches up his sleeve. His 15 minutes includes jokes, some personal stories, friendly audience ribbing, and great up-close magic. Zenon's show is a roll up, roll up affair - the man himself can be seen striding about The Carnival's Edge with a megaphone, encouraging punters to fork over $5 for a quarter hour in his tent. His shows go on as soon as the audience reaches a reasonable size, so it's a good way to start or end your evening if you've booked in for another show. It's possibly the best $5 you'll ever spend. I have spent larger amounts of money on much more foolish ventures. 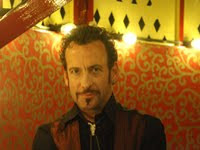 Paul Zenon is a charming, up-close magician that will amaze you and give you a chuckle or three. Well worth the $5 admission!